The total export of handloom from India stood at US$ 350 million for the FY 2015. The handloom industry is the second-largest employment provider for the rural population in India after agriculture. Indian handloom products are known for their unique designs and finesse. The industry has strong infrastructure, with about 2.4 million looms of varied designs and construction, indicating significant production capacity. The export of handloom products rose at a CAGR of 6.9 per cent to US$ 368.0 million in 2015 from US$ 264.2 million in 2009–10. In 2014–15, the US was the major importer of Indian handloom products, with estimated purchases of US$ 107.95 million, followed by the UK and Germany at US$ 29.7 million and US$ 25.4 million, respectively. Italy, France, Japan, Saudi Arabia, Australia, the Netherlands and the UAE were some other export destinations. Exports of carpet and floor coverings, including mats and matting, were valued at US$ 149.82 million in 2014–15, growing at a CAGR of 64.97 per cent from US$ 12.26 million in 2009-10. The power-loom industry has traditionally been a cornerstone of the Indian economy. The industry accounts for 11 per cent of industrial production, which is 4 per cent of the GDP and 12 per cent of total exports. The power-loom industry is equipped with approximately 2.43 million registered looms, which are concentrated in clusters across the country. Production in the power-loom sector increased to about 37,566 million sq. m. in 2014–15 (P), up 2.1 per cent over the previous year. 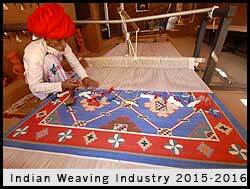 The power-loom industry accounted for around 58 per cent of the total cloth production in India during 2014–1. Approximately 6.1 million workers are expected to be employed in the industry. The domestic weaving market is witnessing strong growth due to a rapid increase in organised retail and disposable incomes; the market is estimated to reach US$ 141 billion by 2021.